"Die letzte Rache" narrates the eventful tale of the Worldly, an adventurer who enters the service of an ageing ruler in order to seek for him a successor. Unable to find a worthy heir, the Worldly succumbs to the temptation to seize power himself. The ruler, however, thwarts his plan and uses the Worldly, by means of a scientific experiment, to attain immortality. The Worldly wreaks vengeance by laying the ruler's kingdom to waste – thereby preparing the ground for unforeseen intrigue: the ruler's son and daughter, united in incestuous love, take revenge for the inheritance denied them by subjecting their now immortal father to everlasting pain and suffering. First broadcast in 1982 on West Germany's second TV channel (ZDF) "Die letzte Rache" rapidly achieved cult status amongst film connoisseurs throughout Europe, Japan and the USA. Even in the more than twenty years following its first showing, this film has continued to attract audiences, with repeated performances in art-house cinemas. Its exceptional blend of expressionist character drama, comic strip, film noir and pop musical ensures that Rainer Kirberg's début film remains to this day a stylistically unparalleled work in the annals of German cinematography. 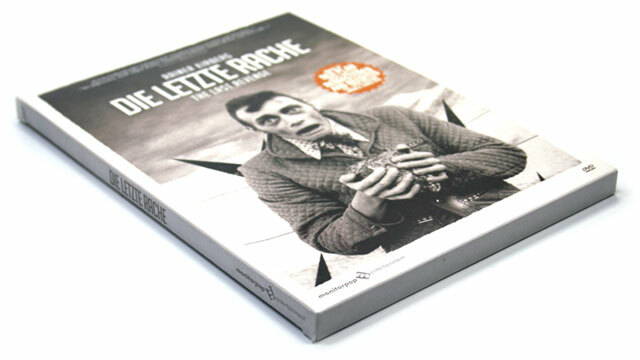 The original film material having undergone elaborate audio and video remastering, "Die letzte Rache" in this DVD edition appears in a new director's cut with additional film music by "Der Plan", a German avant-garde group that was renowned in its day. "Die letzte Rache" is the first Rainer Kirberg DVD to be issued by Monitorpop. This will be followed up in the autumn by a 2DVD featuring "Der Grottenolm" and "Schatten im Zenit", including photo galleries, an interview with Rainer Kirberg as well as a selection of his short films and video clips.